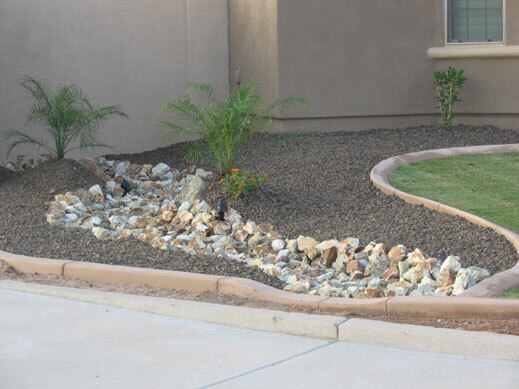 In the Arizona desert we can create a desert landscape design in your yard with a desert theme or xeriscape. 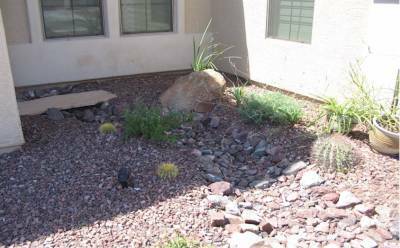 We pick plants that are adapted to our climate and can thrive with little to no water and low maintenance. 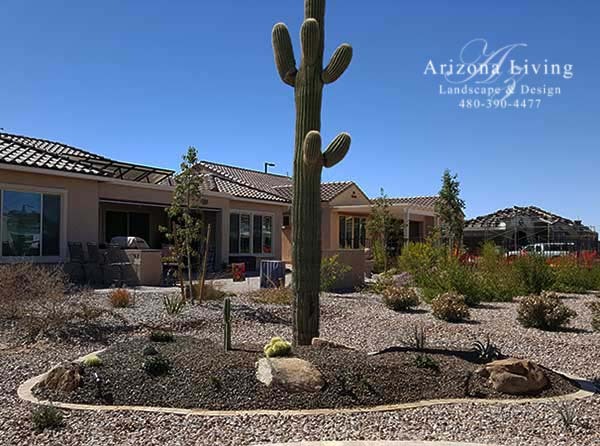 You can choose from cacti and succulents, along with some bushes for color, include earth tone rock, add mounding for depth, maybe synthetic grass for greenery and you can have a beautiful yard that fits in nicely with our climate that will attract hummingbirds, quail, and other wildlife. At the same time you will be using very little of our precious water. 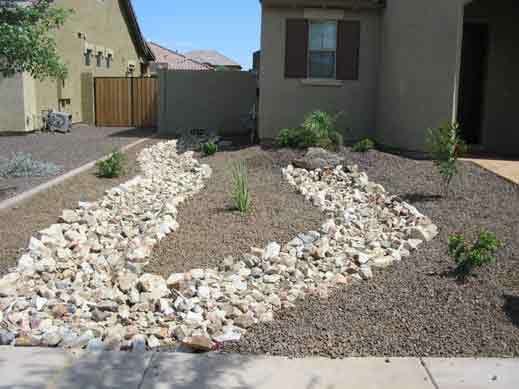 Front Yard landscape remodel in Solera Johnson Ranch neighborhood. This was a plain, flat front yard that needed a lift. 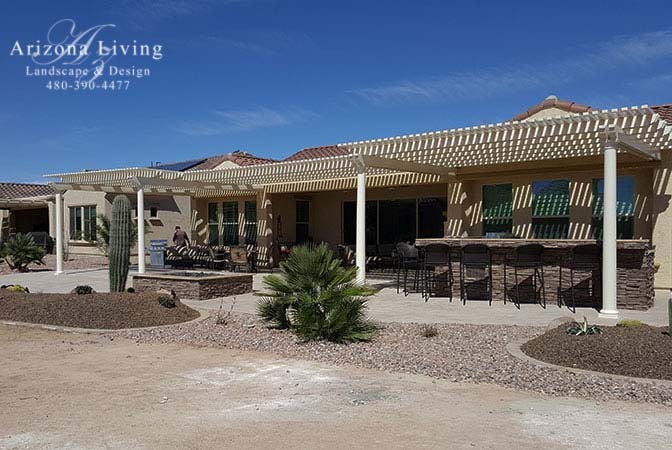 We installed pavers over the entrance way and extended to the driveway with ribbons on both sides to give them more room when parking in the small drive. 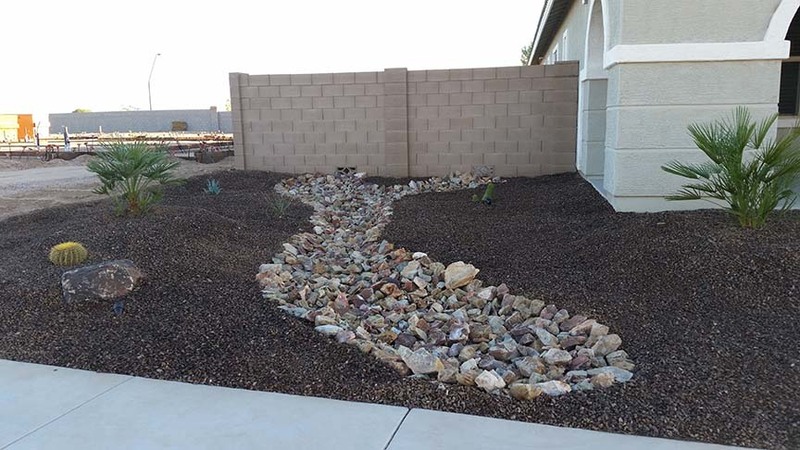 We moved one of the cactus to a new mound on the other side of the driveway, added a riverbed and more mounding with new plants. 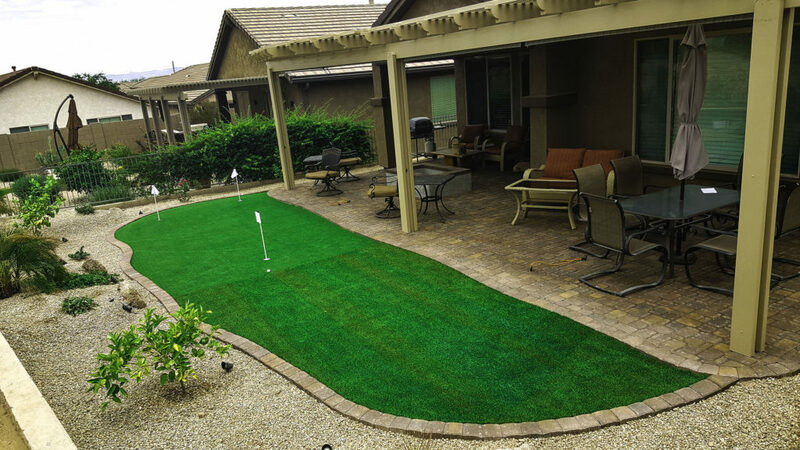 Check out our before and after pictures of this yard. 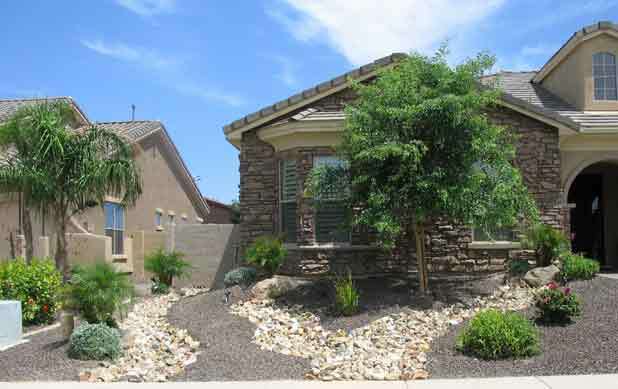 New house in Queen Creek, Arizona Morning Sun Farm. 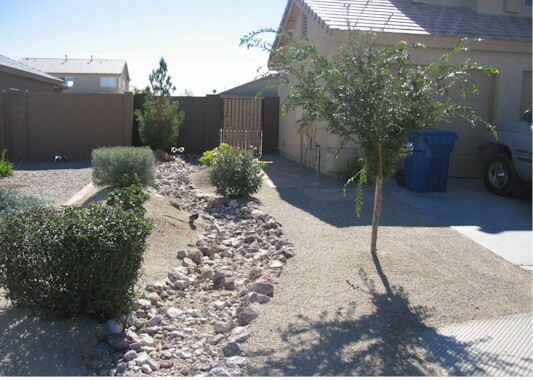 We installed a new front yard in place of the builder supplied desert yard. 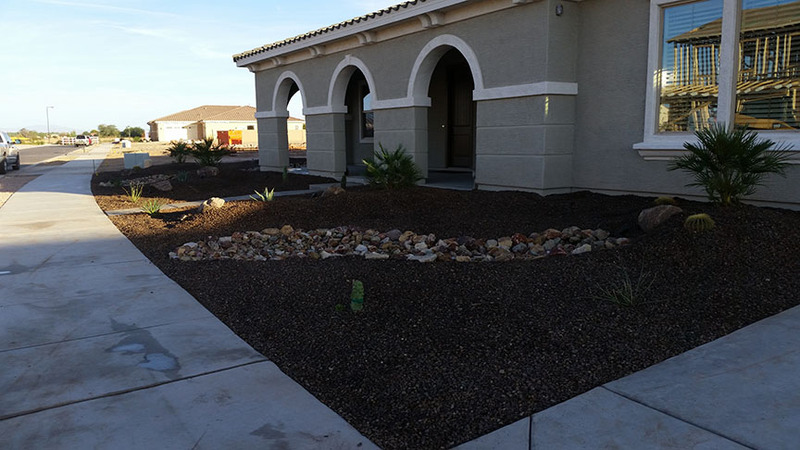 We added depth with mounding, meandering river bed, desert plants that are low maintenance and low water use, and installed a paver patio over the existing concrete entrance and extended the sidewalk to the street. 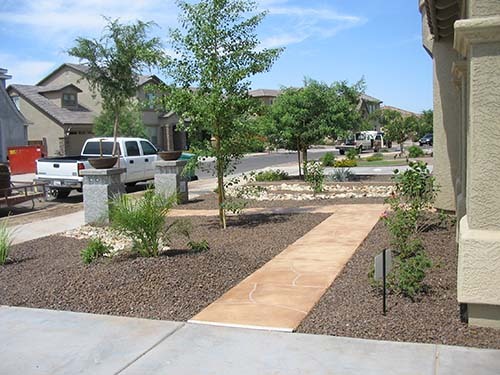 We also installed paver sidewalk ribbons on both sides of the driveway. 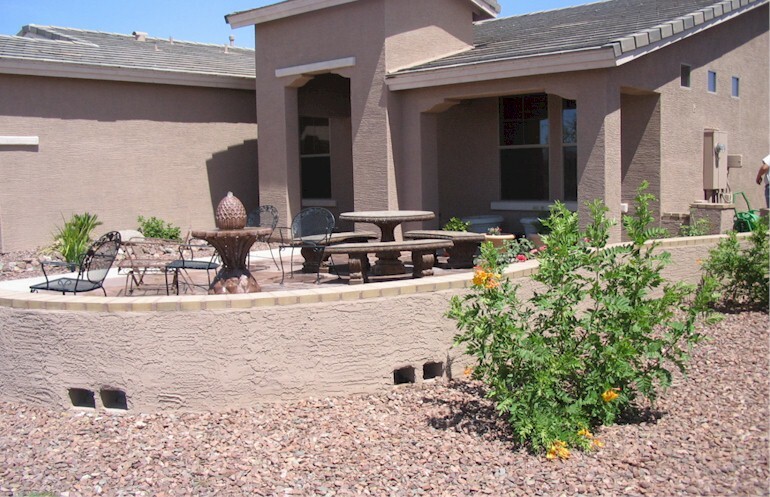 The front yard definitely stands out from the other builder installed landscapes.